Tonight is a "take" on the lamb sliders we made yesterday in Gainesville, Ga. I am making burgers not sliders and am jacking around the recipe to both fit what I have in the pantry and what I like. We will have the burgers on buns with a Tzatziki sauce (with both fresh mint and dill), and a nice side vegetable yet to be decided? The burgers are made and are resting, the Tzatziki sauce it done and tightly covered in the fridge. Time to have a beer and wait for the time to light the grill. So, I'm telling you that "The Big O" Oktoberfest Lager " beer from Pennichuck Brewery in Milford, NH is a damn good beer. I rate it in the high 9's on my informal taste rating scale. I have bought a couple of the Big Bottles. The price tag is way on up there, but it is truly a premium beer, I am only imagine what this would be like on tap? The 350ml bottle is in the $5.00 range but really worth the taste. Last night I realized I had some leftover chicken I needed to do something with. So I whipped up chicken fried rice with a jasmine/parboiled rice combo (cold), scallions, garlic, ginger, edamame, some Indian peas whose name I forget and a small habanero. Cooked in a wok with olive and sesame oils. Turned out pretty tasty. I had some chix thighs marinating, and some broccoli cut up, and was waiting on dinner time, figuring out how to charge up a pot of rice. I did not use the interesting BBQ Sauce that I scored at Eggtoberfest, there are so many new items out there. This is Big 'un's Carnivore Sweet Carnivore sauce, I didn't get the Chipotle. Here is the link to the BBQ sauce.. It really is good. The Broccoli was pretty standard, the Rice had a semi-Korean flavor, I re-hydrated some Super H. Mart squid slivers in the rice water. We used a different rice this time moving away from you Tamaki Gold rice that I/we love, I think this one is Kokua Gold....? <after the fact>... I didn't use the BBQ sauce. The chicken looked so good I didn't want to fiddle with it. Here is a pic of the plate. I know, it is "unsauced" but we like it that way, and with a bit of Tamari sauce on the broccoli it was delicious. You can see the bits of squid sticking up out of the rice. 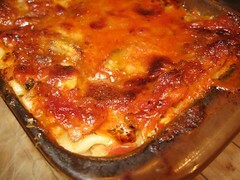 I make lasagne a lot - must be the Garfield in me. 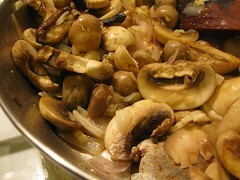 Last night was veggie with a great load of mushrooms, including white, shitake and straw. The straw mushrooms were canned but not like the ones you get at Kroger. These came from Buford Highway Farmers Market were rounder and firmer. Last night was the coven's potluck dinner in celebration of Samhain. One of our members brought a fantastic chicken and sausage gumbo. It was so yummy, I ate two bowls. Did you make anything special for Samhain? Unfortunately no, although I did bring a nice cheese plate from Whole Foods. Time's been on the short side lately, so nothing homemade this time. I ran into a few of them at PPD a couple of weeks ago. We went the easy route last night with a wonderful salad, some cooked-then-fried potatoes, and a thick, rare, NY Strip steak.. The steak was done just right and the potatoes were crispy, and soft in the middle. so good.. Here are two pictures. ( you gotta know by now we almost always eat the salad first and then cook the steak ). Good, rich, semi-sweet Lamb cooked into Tajine. It was delightful, and soft, and had the fruit and almond taste. I did not add the sultana raisins, as I added dried apricots and fresh pear. It is spicy but not hot, and warm tasting. Here are a couple pics of the process and the finished dish. Cooking it down in the enameled cast iron Dutch oven. The finished plate. What a good use of an extra, very lean chunk of lamb. Great looking lamb, I never cooked in a tajine nor do I own one. We had turnip greens and great northern beans last night. And I whipped up a broccoli casserole that was pretty good, just enough for 2. Reheated some of the bread I made and that was dinner, not too bad for a week night. Crisped sweetbreads with spiced carrot puree. Matzoh ball soup with chicken, carrots and celery. Sandwich tray with Patak corned beef, smoked liverwurst and Hungarian salami and all the accoutrements. Homemade ice creams for dessert - Bailey's/chocolate and ginger/honey - with pocky sticks for garnish. All The Scientist's favorites in one very special lunch, since it wasn't just the day we got married. It was also his birthday. Everything was very good, and we made enough that we still are eating leftovers. There is no such thing as too much Patak corned beef. Your meal sounds incredible FG. I made this soup last night and it was very good. Started with leftover turnip green stock, chicken stock and a bouquet of star anise, all spice, cinnamon and coriander seed. Finished it with leftover shredded chicken that was smoked, carrots, celery and udon noodles. Good food for a dark, rainy night. Last night was basil rolls. For the prof, I sauteed some shrimp in garlic and butter. Mine had chicken boiled in stock and then shredded. Mutual ingredients were carrots, Korean radish, scallions, zucchini, udon noodles coated with toasted sesame oil, spinach, ginger, mint and basil. Dipping sauce was made of fish sauce, soy sauce, Sriracha, sweet rice wine and finely ground peanuts. Tonight is French onion soup with sourdough and gruyere. There are so many recipes for this dish.. it is hard for me to nail one that I think is the BEST..
What we tried again last night (by request) was Shrimp and Boursin Grits, with a salad. We love Shrimp and Grits, and we really like how so many recipes around these simple ingredients have evolved. Our Shrimp and grits were way simple, using Quick Cooking (Jim Dandy), (not instant) grits and Boursin Cheese. I'll post the recipe for anyone interested, but it is like way too easy. CP built this wondrous salad, and when we had eaten it I put the skewered shrimp on the Big Green Egg for 3 1/2 minutes a side, pulled them off and finished up the grits. I possibly should have had some kind of a red-eye-gravy sauce to put on the shrimp, but they were smokey and barely done, and on top of those rich grits were like manna from Heaven. Here is a pic of the finished dish, and a link to the process.